While there are certainly dogs out there who are truly aggressive, most of them haven’t learned how to act in a socially acceptable manner, or they started reacting aggressively after a bad experience. 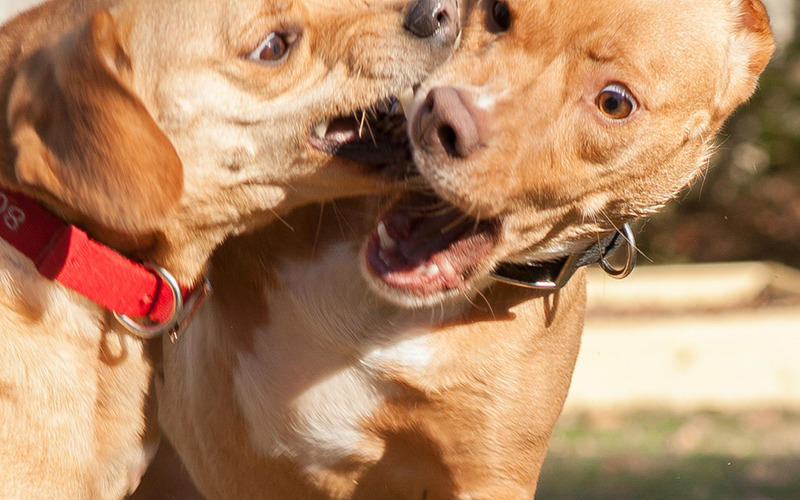 One of the most common types of dogs we see are ones who are labeled as aggressive with other dogs. The vast majority of these dogs are discovered to be reacting out of fear or uncertainty. However, with our aggressive dog rehabilitation program socially awkward dogs learn how to build better coping mechanisms with dogs as well as what’s not appropriate behavior. In an attempt to resolve the issue themselves, many owners try using a dog park or other environment with strange dogs. Not only is this incredibly dangerous for the dogs and people involved, it’s also ineffective. Although the idea of dog parks is nice, with a few exceptions, the environment itself is unstable. When we socialize dogs in our training program, everything is controlled and the dogs are advocated for. In a dog park setting, that level of control is impossible because you can’t tell another dog owner what to do with their dog and often times people have different ideas about what’s OK behavior and what’s not. We’ve had many clients whose dogs were great with other dogs until they were attacked or bullied by other dogs at the dog park. This is another reason why we don’t recommend they be used at all. It much safer and beneficial for your dog to have highly controlled socialization sessions with experienced people. There are many dog trainers who offer dog structured dog socialization sessions. The most common type of dog reactivity is on the leash. If your dog becomes tense, barks, lunges, and otherwise makes a scene when they see another dog, more than likely they have leash reactivity. The difference between a leash reactive dog and an aggressive dog is that they USUALLY are fine off leash, and don’t want to hurt the other dog. Reactivity can be caused by many reasons from bad experiences to, believe it or not, allowing your dog to always interact with another dog. To elaborate, a lot of dog owners only allow their dogs to be around other dogs in an excited manner. This happens a lot at dog parks and a lot of doggie daycares when the only gear dogs interact with each other is 100 mph. What happens over time is these dogs become conditioned to ALWAYS be able to interact with a dog they see, and then become frustrated if they can’t. Dog reactivity stops when your dog sees you as someone who can handle the situation without their input. Using food or toys to only redirect a reactive dog rarely works because they are only focused on their target. It’s important to have a “YES” and “No” conversation with your dog. Spanky was another dog who came to us after being in a rescue facility in Vermont. He had quite the wrap sheet and was banished from being walked because he would pull on skin and clothing leaving big bruises. His behavior sheet also said that being around other animals would be inadvisable because he was aggressive with them, especially smaller animals. Honestly, we didn’t know what to expect when Spanky was on his way to us but were prepared for the worst. One Spanky arrived it was a pleasant surprise to see a dog who simply needed direction. He wasn’t aggressive in the least and turned out to be an extremely dog to work with. Not only did we get along fabulously with the other dogs, he was great with the cats too. Spanky eventually left for his home in New York, but will always be remembered. 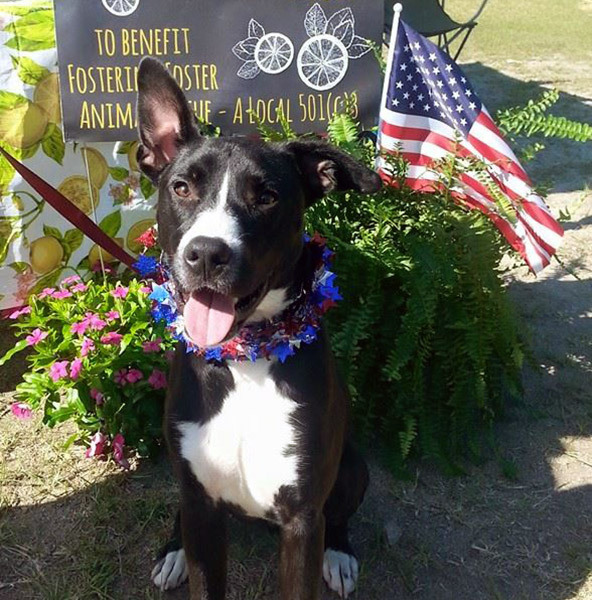 In 2013 we were contacted by staff at an animal shelter about Emerald (now known as Raven)a little Pit mix who was going to be euthanized due to her dog aggression. I went to look at her and decided to take her into my training program. One thing we noticed right away about her is that she was very unsure about herself. After working with Emerald for a few weeks it was obvious that she wasn’t truly dog aggressive, but lacked the proper socialization skills needed to interact with other dogs. Eventually, she was able to play with our personal dogs, one of them being an 8 pound Chihuahua mix. 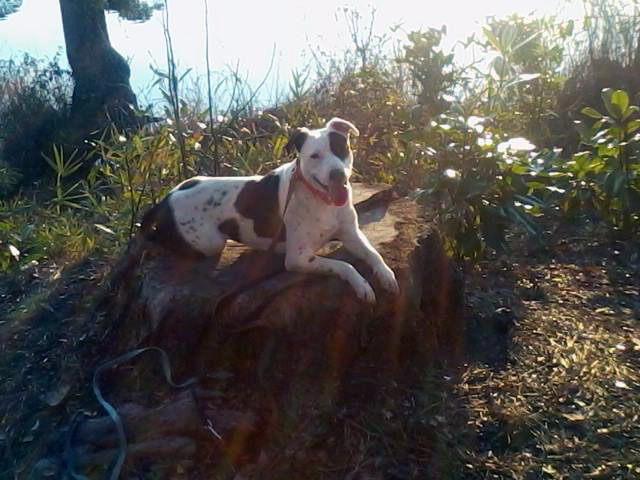 Emerald has since been adopted and lives in Vermont with a fantastic family.